Osteonol paste with minerals to guarantee an optimized supply of minerals and micro elements. It supports the development of the skeleton and the musculoskeletal system, in paticular in periods of intensive growth. Osteonol contains high available micro elements such as iron, zinc and manganese, which have a high significance for the metabolism of cartilage. For foals from the thrid week of life, for a consistent supply of micro elements such as iron, zinc and mangnese. The Calcium and Phosphorous ratio (1,3 : 1) corresponds to the foetal foal. 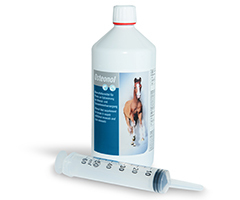 It is reccomended to feed Osteonol to pregnant mare. The paste is palatable and administered via an oral syringe.